Designed for advanced tournament players, the ProPokerHUDs Advanced MTT HUD has everything a serious tournament player will need. Optimized 3 panel design and custom popups will show the most relevant information in an intuitive way to help you make the best possible decisions, gain an edge and destroy the competition. Maximum amount of information displayed in the minimum space possible. 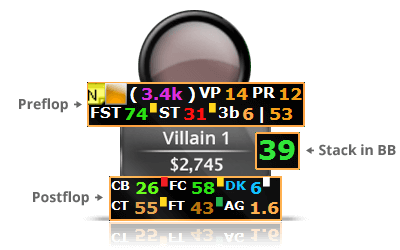 Original 3 panel design with 13 Special MTT/SNG HUD Stats + 7 exclusive color coded tokens system. The custom AutoRate rules help identify players by quickly analysing their statistics. Based on villains tendencies the HUD border color will automatically change. 80 custom note definitions. 22 cutting edge popups to improve the efficiency and effectiveness of the decision making process while multitabling, including the exclusive All-in 3Bet and Non-Allin 3Bet popups, CBet, DonkBet/vsDonkBet, Raise/Check Raise, vs 3Bet, vs Aggressor IP/OOP, BvB, vs Steal and many more. Looking for something even more advanced? Check out the Elite version.